At about the same time that I was rediscovering Sonic with Sonic Adventure for the Dreamcast, Sonic Adventure 2: Battle was being released on the Nintendo Gamecube. There was no question about what I wanted for my 21st birthday. I am sure that I would have loved Sonic Adventure 2: Battle whether I had played the previous title or not. However, since the two titles were tied together so well, I know that I appreciated the Gamecube title all the more because of Sonic Adventure. 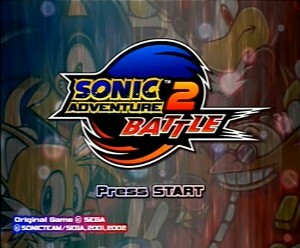 Sonic Adventure 2: Battle was streamlined compared to its predecessor. There were no longer large adventure stages (which I missed terribly, though I am certainly in the minority on that point) or individual characters to select. This time, players chose either the Hero side, consisting of Sonic, Tails, and Knuckles, or the Dark side, consisting of Dr. Eggman and two new characters, Shadow The Hedgehog and Rouge The Bat. The two sides ran parallel to one another throughout the story, and when both sides were completed, a special final chapter opened up involving all six characters. The new characters played important roles in the plot: Shadow the Hedgehog filled the gap that was left when Knuckles became more of a friend to Sonic than a rival. Brooding, mysterious, and yet strangely polite (his referring to himself as 「僕」 "boku" in the Japanese dialogue is particularly endearing), Shadow drove the entire story of the game. Rouge, a selfish jewel hunter with connections to the government, proved to be an excellent foil for Knuckles. 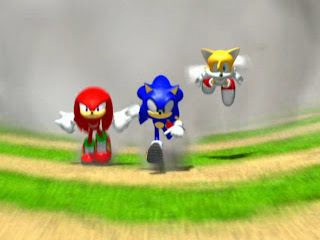 Each character on the Hero side basically had a mirror image on the Dark side: Sonic and Shadow were focused on speed, Knuckles and Rouge were treasure hunters, and Tails and Dr. Eggman, both confined to strange walking machines, had shooting stages like those of E-102γ in Sonic Adventure, so the variety of gameplay was somewhat reduced compared to its predecessor. There was, thankfully, no fishing. Perhaps because pairs of characters now played similarly to one another, each character's stages were unique: there was none of the clever multiple-character level design that I loved so much Sonic Adventure. I spent most of the summer parked on the couch in my room, controller in hand, undertaking the monumentally difficult task of collecting all of the game's 180 emblems. This task was made even more challenging because of the game's plethora of bugs: characters would occasionally fall right through the ground to their deaths, and the controls for Sonic's and Shadow's stages were temperamental at best. I grew to hate grinding on rails or using Sonic's homing attack or light speed dash, since those would more often than not result in a sudden plummet to my doom, due to no fault of my own.. When most of the challenges in the game required perfect, no-miss performance, these bugs had me screaming maniacally at the television all summer long. "So stop playing!" my mother would say. "I'm having too much fun!" was my reply. It was true: never before or since did I find so much enjoyment in playing such a buggy game. The temperamental controls on an already difficult game meant that when a level was played through perfectly, it felt—and looked—really good. Finding the game's secrets, like Knuckles's air tank upgrade in Aquatic Mine, was also exceptionally rewarding. As difficult as the normal stages were, however, getting the emblems for raising the little creatures called Chao wound up taking far more time than completing the main game ever did. The labor-intensive Chao Garden held my patience simply because the characters were so lovable, and also because being in the Chao Garden was the one chance for Tails to get out of the giant Cyclone walker machine that he was stuck in elsewhere in the game. For the entire next year, I would put Sonic Adventure 2: Battle into the Gamecube when I wanted to relax after a difficult day of classes. Even now, I put the game in to run through a familiar level now and again. The gameplay itself is fun, but listening to that music is also a joy. Jun Senoue again did a spectacular job. Each character had his own theme song (the Sonic Adventure 2 version of Sonic's theme, It Doesn't Matter, is one of my all-time favorites), and subsequent pieces of music for that character's stages was in a similar style to the character's main theme. There was rock, there was smooth jazz, there was even hip-hop with bizarre lyrics. Almost all of the music incorporated real instrumental performances, particularly guitars played by Jun Senoue himself. In all, the music was excellent: I quickly picked up Tokyo Pop's domestic release of the soundtrack and gave it a home in my CD player. That game remains my favorite game of the Gamecube years. I've clocked over 130 hours on my save file. On an action game, mind you. A short, buggy action game. Amidst all of my playing, I also did some research, and found that this Sonic Team, headed at the time by 中　裕司 (Yuji Naka), that was putting its name on all of the Sonic products, had spent years preparing for Sonic's break into 3D. They did, I felt, an excellent job, and I began to frequent Sonic Team's Japanese website, even when I couldn't yet read what was posted there. While Sonic Adventure 2: Battle was living in my Gamecube, Sega also released a Game Boy Advance title, appropriately-titled Sonic Advance. The game featured a character roster of Sonic, Tails, Knuckles, and Amy, with each character playing differently. The game even had a special code to unlock a Sonic 2 mode where Tails would follow Sonic around the levels. The gameplay was tight, the music was wonderful, and the animation was charming. I played that game a lot, and it traveled in my little purple GBA on more than one occasion when I went to visit my grandparents. One day, I became so engrossed in the title that I took only the system and the game home with me, and left all of my other games at my grandparents' house! Shortly thereafter, I found myself with access to most of the previous Sonic titles: Sonic Mega Collection, a compilation of Genesis titles, was released on the Gamecube. I suddenly had a huge collection of titles at my fingertips, including Sonic 3D Blast, the lackluster title whose reviews I had confused with Sonic Adventure's. One of my favorite features on that disc was the inclusion of the opening and ending movies for Sonic CD; I would sometimes pop the disc in just to watch those movies.. Speaking of great animation, I also picked up ADV's domestic release of the Sonic The Hedgehog Original Video Animation. Marketed as Sonic The Hedgehog: The Movie, I had thought that the program was a domestic production and would feature original American characters like Sally Acorn. Imagine my surprise, then, when I put the title in and found that it was a Japanese production, overseen by Sonic Team, and animated in the same style as Sonic CD. I brought the program in for viewing by my college's Anime Society, and it was one of only two titles seen that year (the other being Please Save My Earth) that was universally enjoyed by the club's members.. I also managed to pick up Sonic R on the PC. My computer at the time couldn't play Redbook Audio for some reason, however, and so I played the game without the benefit of music. It was still a fun title, but I would be blown away years later when I would actually hear what the game sounded like with songs like Can You Feel the Sunshine playing in the background. It was at about this time that Sonic Team did the first thing that truly irritated me. Sonic Advance 2 was announced, featuring a new character: Cream The Rabbit, a little bunny who could fly by flapping her ears. Why did the Sonic series need another flying character? Tails was already in Sonic Advance 2. With two characters who played very similarly, Sonic Advance 2 lost some of its charm for me. Add that to the extremely convoluted method of collecting chaos emeralds, and the obnoxious boss fights, and the title became a game that I had little motivation to play. It was a shame, too: the graphics and music were a cut above those of Sonic Advance. My collection of old Sonic titles would be further bolstered by the release of Sonic Adventure: DX, an enhanced release of the game that rekindled my love for Sonic, this time on the Nintendo Gamecube. It was wonderful to replay the game with improved graphics, and this time, there was a huge motivation for collecting all the emblems: a full collection of Sega Game Gear titles and a playable Metal Sonic. The game's new mission mode was occasionally exceptionally frustrating (such as collecting tiny flags while snowboarding down a hill) and the game was still extremely buggy, but at least I could import my champion Chao, Dash, in from Sonic Adventure 2: Battle to win all of the Chao events for me. 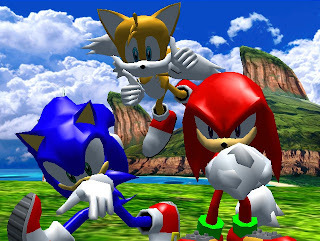 Then, just before my last year in college, Sega released Sonic Heroes. I had been looking forward to the game since its spectacular preview in the Mario Kart: Double Dash bonus disc, and I eagerly leapt into the game. The graphics were great, the music was fantastic, and the atmosphere was a bit closer to the Sonic titles of old. I thoroughly enjoyed playing through Team Sonic's story; the new mechanic of using Sonic, Tails, and Knuckles all at once was very creative and the dialogue between the characters was a lot of fun. The Gamecube version did not offer Japanese voice acting, but the English voices were wonderfully fitting, particularly those of Sonic, Knuckles, and Eggman, not to mention William Corkery's youthful and energetic Tails. After I finished Team Sonic's story, though, I suddenly found that I had to play through the story with the other three teams—all of whom played similarly and had similar stages to complete. My patience waned. I did complete the game, however, and I often go back to replay stages—but only Team Sonic's. Finally, just as my college career was ending, Sonic Battle appeared. A bizarre Sonic fighting game (but not the first), the game was notable for having an absolutely brilliantly-written story. The gameplay was strange, the ending bittersweet, but it was a wild ride, and it helped to even further define the characters' personalities. Amy Rose, Sonic's self-proclaimed girlfriend, was particularly fun to see in action: her dialogue betrayed a dangerously unstable personality. Though it was not a traditional Sonic title by any stretch of the imagination, I still feel compelled to revisit the title from time to time.. It was about that time that I discovered the import store Game Music Online (now sadly defunct), and so swiftly leapt at the opportunity to purchase the Multi-Dimensional Sonic Adventure 2 Original Soundtrack, as well as the CDs for Sonic Heroes. Unfortunately, I could not get my hands on the soundtrack to the original Sonic Adventure, but the three CDs that comprised my Sonic Heroes collection lived in my CD changer during my senior year of college, and the upbeat music helped me to wake up every morning before class. That was not my only prized Sonic possession, however. During my junior year in college, I also managed to get my hands on a doll of Tails. Modeled after his Sonic Adventure appearance, the little toy was perfectly-sized and had a bright smile. As a grown man, I probably shouldn't readily admit this, but I snuggled that toy quite a bit. My closest friends in college came to associate me with the toy, but rather than tease me about it, they chose to find it charming (I had good friends in college). My best friend during my college years, a dedicated video game fan herself, also appreciated the presence of a huggable Tails on more than one occasion. During those years, the Sonic series was such a source fun and relaxation, and Tails such a source of comfort, that I felt compelled to give the little fox some sort of recognition. I had particularly came to appreciate Tails during the end of my senior year. Writing a senior thesis can be daunting, and there was many a late night that I spent huddled in front of the computer, Tails sitting snugly in my lap, as I frantically typed away at the keyboard or fought what would ultimately be a losing battle against my spectacularly uncooperative printer. "I extend deep and heartfelt thanks to Miles for helping me believe in myself and fly ever higher." Tails always wanted to be a hero. Well, little guy, you're certainly a hero to me.